Aside from having a fear of mayonnaise, I also have a striking fear of having somebody shove their fingers literally into my face. A strange fear, I know, but that’s why this week’s Sunday Bloody Sunday is all the more personal to me. If you’ve never seen Peter Jackson’s bloody brilliant Dead Alive (aka Braindead), then you shouldn’t be reading any horror sites anymore. Your privileges have been revoked. But if you’re like me and have seen a couple hundred times, then maybe one of your favorite scenes is when the nurse gets a face full of Mum’s fingers. Watch below and enjoy the deadly digit demise. Try saying that 5 times fast. It pains me to not be able to put the ‘Ebay’ in front of ‘Find Of The Week’ for this post today, because that means what I’m about to talk about is sadly not for sale at the moment. Upon searching for photos of Peter Jackson’s classic gorefest Dead Alive (aka Braindead) yesterday, I stumbled across a legit picture of a randomly amazing promotional item for the Japanese release of the 1992 film on VHS. 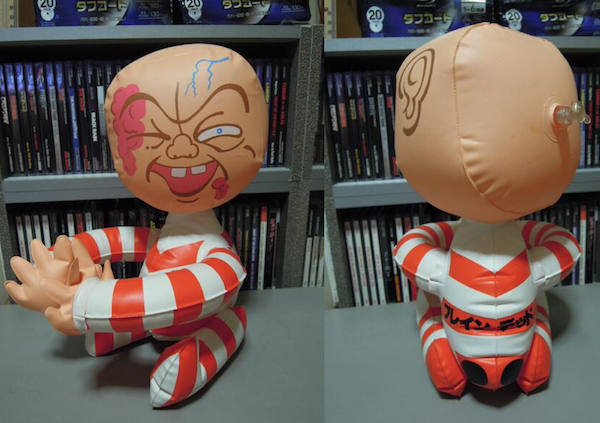 Thanks to Ghoul Basement for the info, below is a pic of an inflatable version of the maniacal face-ripping baby that you apparently could have owned if you lived in Japan. Easily one of the best promotional movie items I’ve ever seen. But it’s such a tease! The tease being because you basically can’t find one and I would imagine that if one of these babies showed up on Ebay, they would go for a pretty price. So unfortunately, all we can really do is just stare at the pic and imagine what it would be like to have a creepy inflatable Dead Alive baby in our possession. Just don’t stare at the pic too long, because then not only is the inflatable Dead Alive baby creepy, but you are too.